David Mihm is a local SEO legend. He’s been a leading figure in the SEO world for years. Recently, he started a new firm called Tidings, that helps businesses achieve success in local markets. We’re honored to present you his fantastic answers to five pressing questions on local SEO. Find out what you should focus on if you want to be successful in your area! You’ve been in the – local – SEO business for a long time now. You’ve seen many trends come and go, but what was the most striking change you’ve encountered in local SEO in recent years? Well, I’m going to cheat a little. I’d say there are two very important trends. These are far more important for the average local business than any given algorithm update over which so many SEOs obsess. 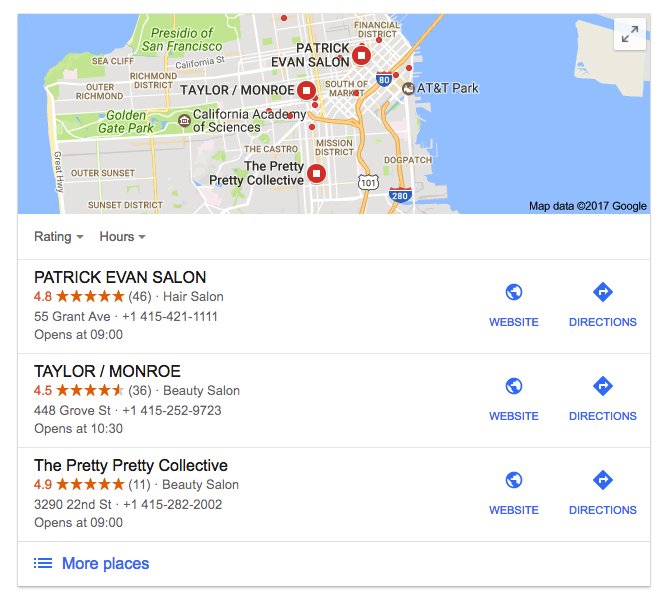 These are 1) Google’s increased monetization of local SERPs, and 2) Knowledge Panels. I wrote about both of these pretty extensively in my 2017 predictions post. Google is showing more Adwords than ever above the fold; that won’t be news to anyone. What might be news are some of their hybrid ad/local units. We’re seeing them now in the hotel space and some home services verticals on the U.S. West Coast. Within a couple of years, these hybrid ad formats will roll out to every category, and every geographic market in the world. The availability and visibility of organic inventory will decrease. In parallel, Google has been moving into a world of answers, not websites. They want to present as much information as they can about a local business directly in the search result. This way the need for searchers to click through to a business’s website will decrease. We’re seeing more and richer information like photos, reviews, busy times, critic lists on which the business is included. There’s also an increase in the ability to transact with the business right from the SERP. Especially in the hospitality, restaurant, and personal care industries. Of course, websites still play a crucial role in helping Google determine the relevance and authority of your business. But you’re going to get fewer clickthroughs from Google. Even if the number of customers they send you remains consistent. Why is there this distinction between Local SEO and regular SEO? What are the main differences between the two? There are two prongs to the differences. The first is that since the Venice update in ca. 2011, Google has been localizing organic search results to the geographic area of the searcher. If I search for something like “bankruptcy lawyer,” Google interprets that search as inherently local. I’m looking for a bankruptcy lawyer near me, not in New York or Hong Kong or London. So they sprinkle in websites from local bankruptcy attorneys for this “global” query via some local filter on their traditional algorithm. I didn’t specify “Portland, Oregon” in my search, but Portland bankruptcy lawyers appear right alongside the largest websites in the world like Yelp, Avvo, and Findlaw. Optimizing a website and backlink profile to have a strong local scent is a different skill set than optimizing an eCommerce or media website. The second prong (one with an even greater difference than traditional SEO) is that there is a fundamentally different algorithm at work that ranks the business listings included in what we call the 3-pack: the visual unit that appears between the ads and organic website results. This algorithm is built largely on ranking factors that aren’t in play for a typical organic market: business listing data, user reviews, proximity to the searcher, and many others. It’s hard to rank in a neighboring area or town. So what can you do when your business is not close to the center? Or when you live in a small town? Can your business compete with those in a larger city? It’s going to be hard. You’re probably better off trying to win business on social media than you are in local search at Google — at least for keywords in the major city — in this instance. The best chance you have is to compete organically by targeting specific pages at the larger city. The best/easiest kind of content to populate these pages is usually case studies from customers who live in the larger city. Beyond that, it’s going to take an overwhelming review profile (as in 10x the number of reviews of the most-reviewed big city competitor) to get noticed in the 3-pack. And that takes a LOT of time and a lot of effort. So my general advice would be to dominate your small-town market. Get as many customers from your “backyard” as you can. Then start to gradually expand to the bigger city using word-of-mouth, targeted offline business partnerships and referrals, and eventually social media. Let’s say you have limited resources available to work on your local SEO. You can focus on a maximum of three things. What would you advise? Thinking about the longest-term benefits for local search, I’d say you should focus first on your website. Make it mobile-responsive, answer the most common questions your customers have, showcase customer stories and case studies, and make sure you convert people who are already clicking through to it. Next, I’d focus on building offline relationships in your community (but make sure they’re represented online as well). Think about relevant non-profits to which you can donate time or money, get involved in community events, and figure out how you can network with and support complementary local businesses to your own. And then I’d implement a really great review acquisition platform. Getting happy customers to talk about your business on prominent review sites like Google, Yelp, and Facebook is not only an increasingly important ranking factor, but it helps convert prospective customers who see all of your great ratings. The great thing for local businesses is Local SEO should get less-technical over time. Things like title tags, citations and backlinks are certainly still important, but I see their relative value diminishing as Google collects more and more engagement signals from individual customers. Today’s marketing landscape seems to revolve in large part around social media. How important is social media for Local SEO? Should every local business have and maintain a Facebook business listing? If so, how? Social media is important for a holistic digital presence and does have some value for Local SEO. All kinds of studies show that customers are more likely to buy from a business that shows some engagement on social media — an active presence gives people a better feel for your business before they decide to purchase from you. Every local business should maintain a Facebook business page — not least because Facebook, at some point, will decide to leverage the huge amount of data they have around local businesses and launch a local search engine of their own. You’ll want to have a strong presence out of the gate when that happens. Beyond that, Facebook pages regularly rank well for your business name, so they’re great for reputation management. And we routinely see Facebook reviews pulled into the Knowledge Panels for local businesses in virtually every industry. So from that standpoint, we know Google is at least able to assess your volume of Facebook reviews (if not the content of the reviews themselves).